The well-known cyber security firm, Group – IB, partnered with the crypto-asset insurance company, Cryptolns, to grade the security levels of the top cryptocurrency exchanges across the globe. According to the research done by these two firm, Kraken has the safest cryptocurrency exchange platform. However, OKEx, the second biggest cryptocurrency exchange in the world in terms of daily trading volume, HuobiPro and CoinCheck are the worst in terms of security. Group-IB reached these conclusions using a brand new assessment tool that had been developed to calculate insurance premium covers for cryptos held by major exchanges across the globe. The law firm Perkins Coie has named Kari Larsen partner for their Blockchain Technology and Digital Currency industry group. Larsen was previously an executive with the derivatives startup called LedgerX, and also served as counsel for the CFTC (Commodity Future Trading Commission). Most recently, Larsen served as counsel for Reed Smith LLP in New York. Perkins Coie’s industry group chairman, J Dax Hansen made the announcement and stated that Larson was bringing to the table a deep knowledge about derivative exchange platforms as well as the commodities sector and would represent traders as well as CFTC-registered entities that were focusing on launching innovative products. He said that these products would include cryptocurrency related offerings. Thailand’s Deputy Prime Minister Wissanu Krea-ngam had said that there should be more regulations for cryptocurrencies. Thailand has introduced a new regulatory framework for cryptos earlier this gym, however, the Deputy PM stated that additional new measures should be introduced – both domestically as well as internationally. He said that this was necessary to keep up with the new threats and tactics being adopted by cyber criminals. In a speech at the Counter Terrorism Financing Summit, Krea-ngam stated that people should not be satisfied with the security protocols that were currently in place as they would end up lagging behind cyber criminals. Read the details of the story here. 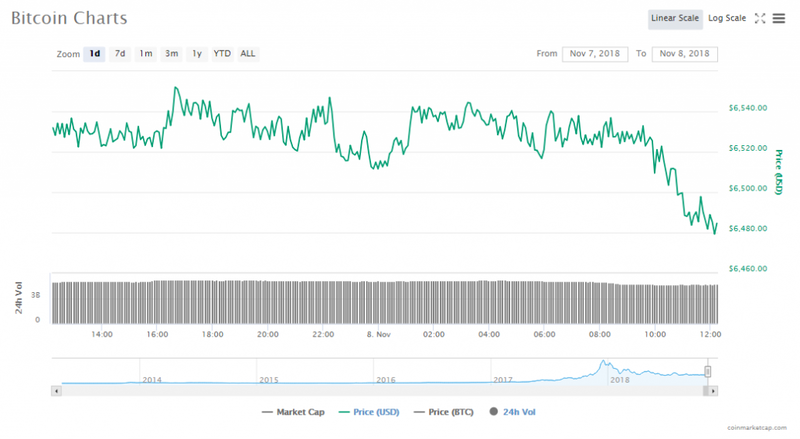 The cryptocurrency market’s value has fallen by $3.69 billion to $216.25 billion. Trading volumes in the market are down by $1.59 billion at $14.67 billion. 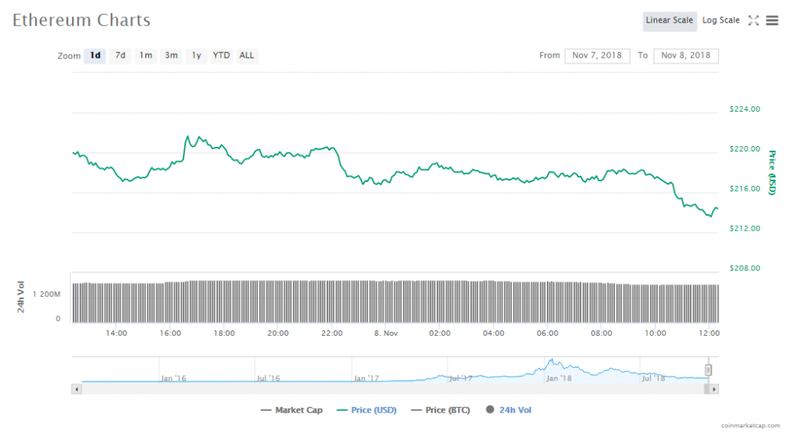 The price of Bitcoin slipped by 0.73% to $6485.17 per token since yesterday. BTC’s market cap is $112.61 billion and is currently trading at volumes of $4.68 billion. Ethereum has fallen 2.41% to a price of $214.29in the last one day. 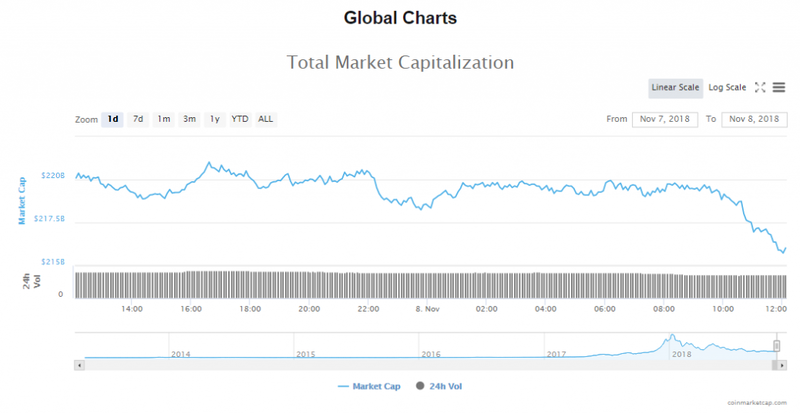 The crypto’s market worth is $22.08 billion and its volumes in trade are at $1.83 billion. Of the 10 most valuable cryptos, 9 are down compared to their prices yesterday. Tether is the only exception and is up by 0.14%. The biggest losses have been experienced by Bitcoin Cash, which dropped by 5.45%, followed by Litecoin, which is down by 4.30% and by Cardano, which has lost 4.26% on its price. Bitcoin is priced at $6485.17, dropping 0.73%. The virtual currency is currently worth $113.35 billion. Ethereum is priced at $214.29, dropping 2.41%. The virtual currency is currently worth $22.08 billion. Ripple is priced at $0.514092, dropping 3.74%. The virtual currency is currently worth $20.66 billion. Bitcoin Cash is priced at $584.30, dropping 5.45%. The virtual currency is currently worth $10.19 billion. EOS is priced at $5.55, dropping 3.02%. The virtual currency is currently worth $5.02 billion. Stellar is priced at $0.251334, dropping 3.39%. The virtual currency is currently worth $4.76 billion. Litecoin is priced at $53.23, dropping 4.30%. The virtual currency is currently worth $3.14 billion. Cardano is priced at $0.076941, dropping 4.26%. The virtual currency is currently worth $1.99 billion. Monero is priced at $111.10, dropping 0.42%. The virtual currency is currently worth $1.83 billion. Tether is priced at $0.994667, gaining 0.14%. The virtual currency is currently worth $1.76 billion. The Ministry of Science and ICT in South Korea announced that a massive new initiative called the Blockchain Technology Development Strategy was being launched, which was aiming to raise 230 billion won (~$207 million). The funding will then be used to support more than 10,000 Blockchain professionals as well as more than 100 companies. A week ago the Quantstamp community accused the startup that audits smart contracts that it was undermining the value of its own $65 million dollar QSP token by accepting US dollars and Ether as payment for its audits. Bank of America, the second largest bank in the US, has said that cryptos pose a material risk to its business. The bank said that this technology could impact its ability to adhere to money laundering laws. Cryptos could also pose as a competitive threat which could force the company to spend more money to stay abreast with customer preferences.